A New Mexico multimillionaire wants you to get off the couch and go searching for hidden treasure. Forrest Fenn, 82, believes too many Americans spend their free time watching TV or playing video games. He hopes the bounty he hid — a chest filled with millions of dollars in gold coins, diamonds and emeralds, among other gems — will prompt some to explore the outdoors. "Get your kids out in the countryside, take them fishing and get them away from their little hand-held machines," he told TODAY. 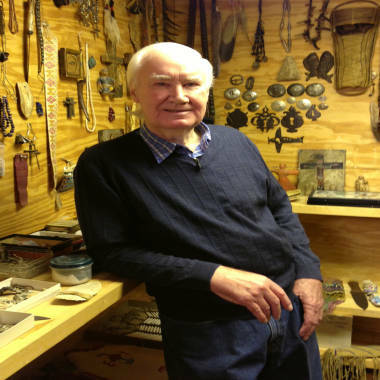 Fenn hid the chest in a secret spot three years ago with two goals in mind: Getting people to fall in love with America's scenic trails and passing on what he calls the "thrill of the chase," something he has experienced over more than seven decades of hunting for rare objects. Santa Fe jeweler Marc Howard has gone searching for the treasure 20 times. "If you read the poem, you'll go, 'Oh my God, how am I gonna find it from this?" said Howard, who makes custom engagement rings. He plans to use the bounty for designing new jewels. "What could a goldsmith want, but free rein with gold?" Treasure hunter Marc Howard, by the Battle Rock formation in the Jemez Mountains of New Mexico, where he's gone searching for Fenn's hidden treasure. The chest, weighing in at over 40 pounds, contains items Fenn has accumulated over more than seven decades of a life that reads like an adventure novel. His love for rare artifacts started at the age of 9, when he discovered a Native American arrowhead near his hometown of Temple, Texas. The son of a teacher, Fenn struggled with his grades and after graduation chose the Air Force over college. "I couldn't see myself sitting in a classroom for four more years," Fenn said. During the Vietnam War, he flew hundreds of missions and said he was shot down twice, in South Vietnam and again in Laos. Even while fighting, the highly decorated pilot didn’t surrender the search for rare objects, flying to Pompeii in his off-time to find artifacts. Twenty years later, he came out of the Air Force with a pension that helped him feed his family, but it was in dealing artifacts and art that he grew his savings into a fortune. In the 1970s, the father of two opened Fenn Gallery on Paseo de Peralta in Santa Fe. The family slept on a mattress on the floor, but eventually moved into a house complete with a home office for his objects, made by Southwestern tribes that he either dug up himself or purchased. "I never went to college, I never studied business, I never studied art," said Fenn in his studio, surrounded by perfectly organized rows of leather moccasins, pottery, beaded dolls and book-filled shelves. "I had imagination, I had guts that made my imagination worth something to me and I was willing to work." Fenn in his "vault," where he keeps prized pieces. In 1988, Fenn was at the top of his career as an art dealer, with clients including Ralph Lauren, Robert Redford and Suzanne Somers, when he received devastating news: He had advanced kidney cancer. His diagnosis showed he had only a 20 percent chance of surviving the next three years. So Fenn started to consider his legacy. He worked on his clue-poem for years, and took his time collecting items to put in the chest. When he felt the treasure was complete and he was strong enough to carry it, he buried it. "After I hid the treasure I walked back to my car feeling very proud of myself and laughing out loud," he said. "I asked, 'Forrest, did you really do that?' There have never been any regrets. Now it is for the ages and a big part of me in that treasure chest. I felt it go in as I closed the lid for the last time." Fenn's passion for collecting hasn't been without controversy. In 2009, federal agents raided his home as part of an operation tracking Native American artifacts that may have been illegally obtained. Fenn was never charged. "Out of thousands of objects (the agents) seized four artifacts, none of which were shown to be illegal," said Fenn's attorney Peter Schoeneburg. 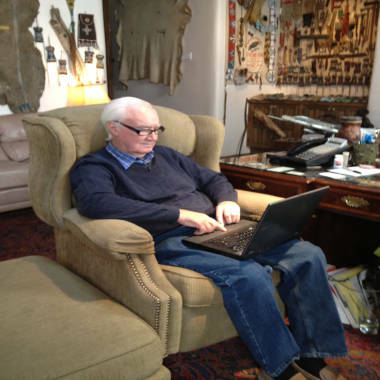 Forrest Fenn reads some of the nearly 7,500 emails he's received from treasure hunters hoping for a hint. Today, the hunt for his treasure has attracted an international following. Fenn has received close to 7,500 emails on the subject. Some ask for guidance on whether to use a metal detector. Others thank him for inspiring a family vacation. One man who said his son always needs a tangible reward, like a milkshake, to go on outings, wrote "thanks for dangling a slightly more attractive offer in front of him to get him out with his old man again." Some wonder if there is a treasure at all. But Howard, the jeweler, who knows Fenn well, sees no reason to question the collector's word. "Forrest is one of the most honest men I know," he said. "If he says he did something, he did it." Nietzel and Howard alone have fulfilled Fenn's goal of getting more people to fall in love with the outdoors. “What drags me out here is the beauty,” says Nietzel. “I’ve seen places I never would have seen.” Howard said his hikes have also taken him to places he would have never visited otherwise. "It's seeing America in the different light, he said. 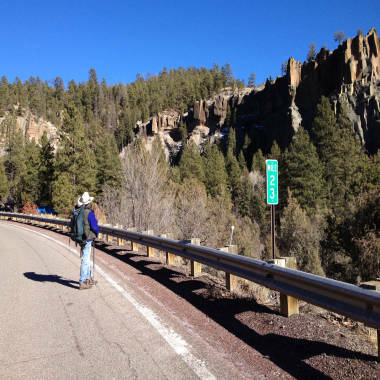 "It's bald eagles flying overhead and big horn sheep on the side of a mountain. It's all those things." More Good News: Follow these clues to find Forrest Fenn's treasure!